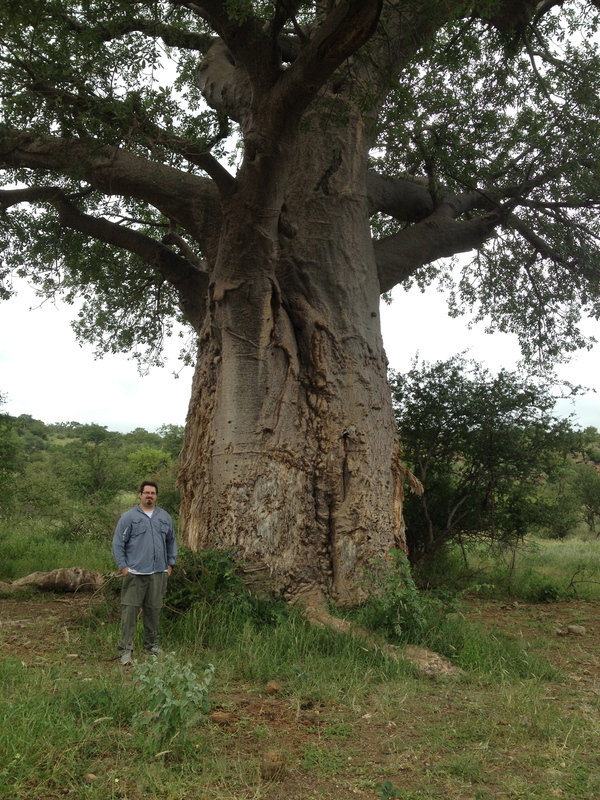 University of Nebraska-Lincoln researcher Trenton Franz stands next to a native tree in South Africa's Mapungubwe National Park in January. 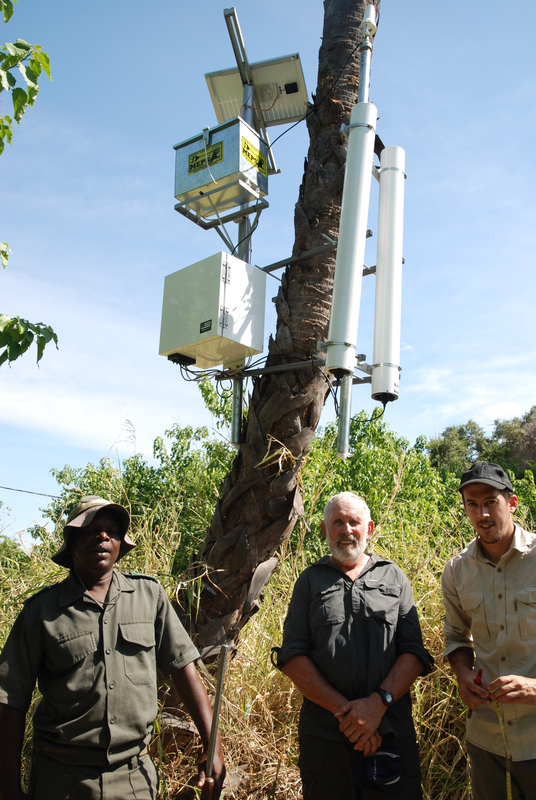 The cosmic ray detector is mounted to a tree in South Africa’s Mapungubwe National Park. Pictured from left: Steven Khoza, South African National Parks field technician and ranger; Colin Everson, SAEON hydrometeorologist and project principal investigator; and Bruce Scott-Shaw, University of KwaZulu-Natal doctoral student. The endangered riparian vegetation at Mapungubwe National Park in South Africa. A University of Nebraska-Lincoln researcher's high-tech soil moisture detector is being put to the test in the wild. Hydrogeophysicist Trenton Franz is applying technology developed for precision agriculture to help protect an endangered native forest in South Africa. Under a National Science Foundation-supported project, Franz is working with collaborators in South Africa to help assess the environmental impacts of commercial groundwater pumping from the Venetia Diamond Mine and well fields near Mapungubwe National Park. Franz's cosmic-ray neutron detector measures hydrogen in the park's ecosystem and detects water stress in the trees and shrubs that make up its rare gallery forest. 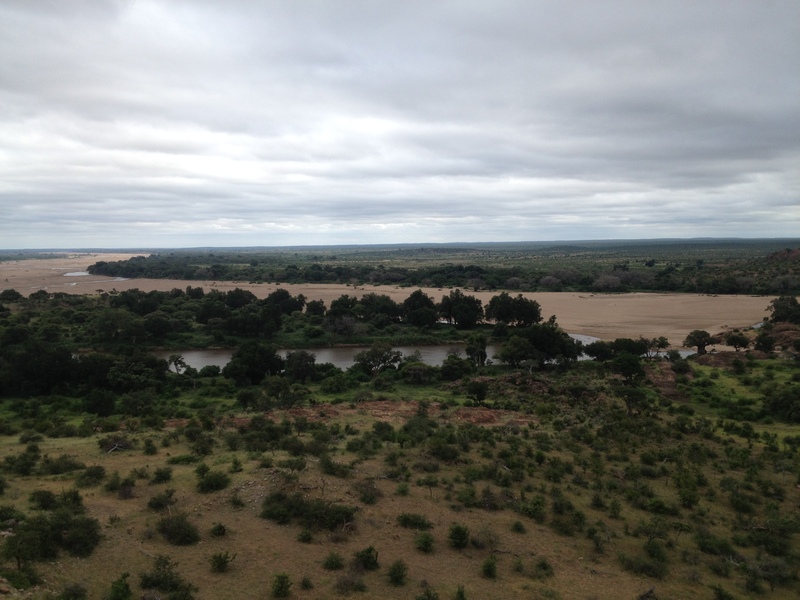 The park, rich with biodiversity and cultural history, is located along the Limpopo River and serves as a major regional wildlife conservation area. The park's vegetation provides a safe haven for elephants, lions, hyenas, meerkats, crocodiles and more. However, the park's once dense tree canopy has become endangered due to excessive water extraction for agriculture and mining, along with damage from elephants. "The region's semi-arid climate combined with high summer temperatures, sometimes topping 113 degrees, creates challenging growing conditions," said Franz, a Robert B. Daugherty Water for Food Institute Faculty Fellow. "Effective groundwater monitoring and management is critical for the park's plant ecosystem to survive." In March, Franz's partners at the South African Environmental Observation Network (SAEON) and South African National Parks installed a cosmic-ray neutron detector to monitor the park's soil moisture and the amount of water inside its vegetation canopy. The device, strategically mounted on a tree out of reach of wild animals, sends data in real time across the globe to Franz's lab in Lincoln for analyses. Franz is working closely with SAEON hydrometeorologist Colin Everson in Pietermaritzburg to combine the data with detailed local vegetation monitoring to determine if and when the forest is being affected by water stress. Once a mathematical relationship between the cosmic-ray neutron detector measurements and the vegetation water stress measurements has been established, the technology may be used by De Beers Consolidated Mines Limited as part of its conservation efforts. De Beers’ Venetia Diamond Mine is 10 miles from the park and relies heavily on the area's water resources to support its operations. Franz's technology has the potential to serve as an early warning system, providing information the company can use to more effectively manage its groundwater pumping and mitigate any detrimental effects on the forest. Franz last visited South Africa in January to help with project data estimates and calibration, and to mentor two graduate students working with the technology across a range of sites in the region. He plans to visit again in early 2016 to continue work on the project and follow up on other research initiatives. For more information on Franz's research, visit http://tfranz2.wix.com/trenton-franz#!research/ca4p. More information on the NSF grant can be found at http://sites.nationalacademies.org/PGA/PEER/PEERscience/PGA_084069. The Robert B. Daugherty Water for Food Institute at the University of Nebraska was founded in 2010 to address the global challenge of achieving food security with less stress on water resources through improved water management in agricultural and food systems. The institute is committed to ensuring a water and food secure world while maintaining the use of water for other human and environmental needs.